Sunday's proceeds from public museums across Italy will be dedicated to rebuilding work after the earthquake that killed 290 people on Wednesday. 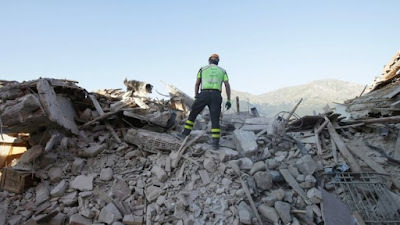 Many churches and other medieval buildings were destroyed when the magnitude-6.2 quake struck Amatrice and other parts of the central region. Amatrice's mayor said he wanted to restore his town to its former glory. The country's prime minister and president both attended a funeral for 35 victims on Saturday. Lingering after the service at a sports hall in the town of Ascoli Piceno, Prime Minister Matteo Renzi talked to some of the mourners. "We will decide all together how to get going again," he told one young person. "But don't give up, that is crucial." Bishop Giovanni D'Ercole told the congregation that people had to be brave enough to rebuild their lives, and their towns. Culture Minister Dario Franceschini said 293 culturally important sites in the area affected, many of them churches, had either collapsed or been seriously damaged. He urged Italians to go out in force on Sunday to visit museums and archaeological sites "in a concrete sign of solidarity" with quake victims,who would be supported by the money raised.